This universal winch channel is made exclusively to fit FJ40 and FJ45s. Channel rest on top of frame rails and simply bolts to existing bolt holes. Mounts strong! Channel is pressed from heavy 3/8 steel. All holes and slots are precision laser cut. Front Channel face is notched to allow for clear tow hook pulls. Channel is designed to allows for 1 or 2 tow hooks. Channel is black satin powder coated and is a FINE piece of work. Universal mount fit most all production winches. ""HFS" Universal Winch Mounting Bolt Pattern" fits almost every winch ~ including Warn, Ramsey and Superwinches. Measure your winch mounting bolt pattern to be 10.0" x 4.5" (254mm x 114.3mm). For winches over 4000 lbs./1814 kgs. 10" ~ Center to Center. 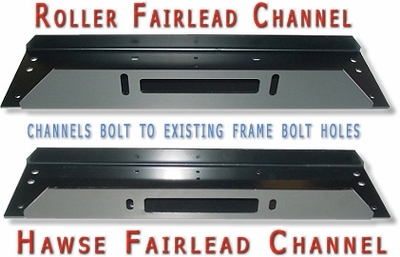 Install Hawse or Roller Fairleads, both bolt on perfectly. Easy Bolt on installation to factory (gusset plates)holes. ULTRA STRONG 3/8" thick steel channel! Weight - 50 lbs. Bumper greatly increases FJ40's approach angle. Wide enough for protection - Narrow enough for tight trail turns. w - 39 3/4"
Break press forming lines may be slightly visible under finish. Designed for strength, tight trail clearance and clean / good looks. HFS Bumper has two laser cut chain slots on bottom side of channel. Angular cut chain link slots hold chains up to 3/8" in diameter. Chain slots are smartly positioned underneath, not to interfere with winch operation. This is the "Toughest FJ40 Bumper Available"! Note: If selected - System will add cost of winch Channel to base price of Bumper. Please order Fairlead separately, if needed.